Vietnam is a long, narrow country in Southeast Asia. 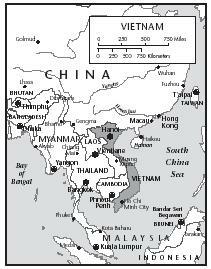 China borders it to the north; Cambodia, Laos, and the Gulf of Thailand to the west; and the South China Sea (which the Vietnamese call "the East Sea") to the east. Covering a total of 327,500 square kilometers (126,500 square miles), Vietnam is approximately the same size as Italy and Japan. The geography of Vietnam plays an important role in the country's cuisine. Rice, the mainstay of the Vietnamese diet, is grown throughout the country but particularly in the Red River delta in the north and Mekong River delta in the south. In fact, the Vietnamese people say that their country resembles a bamboo pole (the narrow central region) with a basket of rice at each end. Although three-quarters of the land in Vietnam is hilly or mountainous, the long seacoast and many inland waterways provide fish and other aquatic species that are staples in the Vietnamese diet. Vietnamese cuisine varies somewhat by region, with Chinese influences (such as stir fries, noodles, and use of chopsticks) in the north, as well as Cambodian (Khmer) and French influences in the south. Climate affects the availability of ingredients, which in turn affects the types of dishes that dominate a particular region. During the winter months in the north, families gather around a big bowl of seasoned broth and cook vegetables and meat in it for sustenance and warmth. A fish dish called cha ca, which is cooked in a similar fashion, is also quite common. The charcoal brazier (small barbecue-like heat source) that keeps the broth boiling sits on the table and keeps the entire family warm. 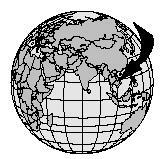 the tropical climate, foods in the south are cooked for a shorter length of time than in the north. In the north, there are many stirfries and slow-cooking stews whereas in the south most foods are quickly grilled or eaten raw. Vietnam is one of the most densely populated countries in the world, with a rapidly growing population, estimated in 2000 to be 76 million people. As the population increases, more land is cleared for agriculture. Estimates in 2001 indicated that less than 20 percent of the land remained forested and 40 percent was considered useless for growing crops. Farmers trying to clear land quickly burn the vegetation to make way for crops. They then overuse the land until it is no longer fertile or suitable for crops. This type of farming, known as shifting cultivation (or "slash and burn"), is practiced most often in the north and in other countries around the world. Too much fishing has depleted the number of fish in the waters surrounding Vietnam, and the coastal marine environment is also threatened by oilfield development in the south. Safe drinking water is another problem in Vietnam. According to UNICEF, only 45 percent of Vietnam's inhabitants have access to safe drinking water and only 29 percent have access to adequate sanitation. In recent years, the government and other organizations have begun programs to slow the pace of environmental degradation by educating citizens about sanitation and sustainable agriculture practices. Neighbors have influenced the Vietnamese people in regards to what they eat and how they cook. People from Mongolia who invaded Vietnam from the north in the tenth century brought beef with them. This is how beef became part of the Vietnamese diet. Common Vietnamese beef dishes are pho bo (Beef Noodle Soup) and bo bay mon (Beef Cooked Seven Ways). The Chinese who dominated Vietnam for 1,000 years taught the Vietnamese people cooking techniques such as stir frying and deep frying, as well as the use of chopsticks. In the south, neighboring Laos, Cambodia, and Thailand introduced such ingredients as flat, Cambodianstyle egg noodles, spices, chili, and coconut milk. Beginning in the sixteenth century, explorers and traders introduced foods such as potatoes, tomatoes, and snow peas. When the French colonized Vietnam (1858–1954), they introduced foods such as baguettes (French bread), pâté, coffee with cream, milk, butter, custards, and cakes. In the 1960s and 1970s (Vietnam War era), the U.S. military introduced ice cream to Vietnam when it contracted with two U.S. dairies to build dozens of ice cream factories. Plain rice ( com trang ) is at the center of the Vietnamese diet. Steamed rice is part of almost every meal. The Vietnamese prefer long-grain white rice, as opposed to the short-grain rice more common in Chinese cooking. Rice is also transformed into other common ingredients such as rice wine, rice vinegar, rice noodles, and rice paper wrappers for spring rolls. Rice is also used to make noodles. There are four main types of rice noodles used in Vietnamese cooking. Banh pho are the wide white noodles used in the quintessential Vietnamese soup, pho . Bun noodles (also called rice vermicelli) look like long white strings when cooked. Banh hoi are a thinner version of bun noodles. In addition, there are dried glass, or cellophane, noodles ( mien or bun tao ) made from mung bean starch. Just as essential to Vietnamese cuisine as rice and noodles is nuoc mam , a salty fish sauce that is used in most Vietnamese recipes (just as salt is used in most Western dishes). Nuoc mam is produced in factories along the coast of Vietnam. Anchovies and salt are layered in wooden barrels and then allowed to ferment for about six months. The light-colored, first-drained sauce is the most desirable. It is also the most expensive and reserved primarily for table use. Less expensive nuoc mam is used in cooking. When shopping for nuoc mam , one should look for the words ca com on the label, which indicates the highest quality. The most popular condiment is nuoc cham (dipping sauce), which is as common in Vietnam as ketchup is in North America. Saucers filled with nuoc cham are present at practically every meal, and diners dip everything from spring rolls to meatballs into it. The recipe that follows can be adjusted to suit individual tastes by using more or less red pepper and nuoc mam. Nuoc cham is quite simple to make and will keep in the refrigerator for up to 30 days. A few spoonfuls over a bowl of plain rice can be considered an authentic Vietnamese peasant meal. In a small bowl, soak the red pepper flakes in the vinegar for 10–15 minutes. In a second bowl, combine the fish sauce, lime juice, garlic, and sugar. Stir in 1½ cups boiling water and the pepper-vinegar mixture. Stir until the sugar is dissolved. Allow to cool. Serve at room temperature. Store in a jar in the refrigerator for up to 30 days. Fish and other aquatic animals, such as squid and eel, are central to the Vietnamese diet. Beef, pork, and chicken are also important, but are consumed in smaller quantities. The unique flavorings in Vietnamese cooking are created with a variety of spices and seasonings, including mint leaves, parsley, coriander, lemon grass, shrimp, fish sauces ( nuoc nam and nuoc cham ), peanuts, star anise, black pepper, garlic, shallots, basil, rice vinegar, sugar, green onions, and lime juice. To provide a contrast in texture and flavor to the spicy meat components of a meal, vegetables are often left raw and cut into small pieces (usually cut at an angle, or julienne), especially in the south. Cool, crunchy foods include cucumbers and bean sprouts. The typical Vietnamese meal includes meat and vegetables, either eaten with chopsticks and rice or rolled into rice paper or (red) leaf lettuce and dipped into an accompanying sauce. Traditional preparation techniques are determined by eating habits, geography, and economics. Pho bo (Beef Noodle Soup) is the signature dish of Vietnamese cuisine. It is often eaten for breakfast, purchased from sidewalk vendors on the way to work or school. Pho bo is also a common home-cooked meal, and it is a fun dish to prepare for a group. Seated around a table with dishes of ingredients in the center, each person is given a bowl of spicy beef broth. Then, each selects his or her vegetables and noodles to add to the broth. No two bowls of pho bo are alike. Dessert is not as common in Vietnam as it is in North America, except perhaps for a piece of fresh fruit. One exception is sweet coconut custard, which might follow a celebratory meal. Make broth by pouring contents from three cans of broth into a large saucepan. Add carrots, ginger, cinnamon, star anise, cloves, garlic, and peppercorns. Simmer covered for 20 minutes. Add fish sauce and simmer about 5 more minutes. Strain by pouring through a colander. To serve, arrange the following on a platter: beef, onion, bean sprouts, cilantro, basil, chilies, lime wedges, and noodles. Ladle the broth into bowls, and serve. Each person chooses items from the platter to add to his or her bowl of broth. 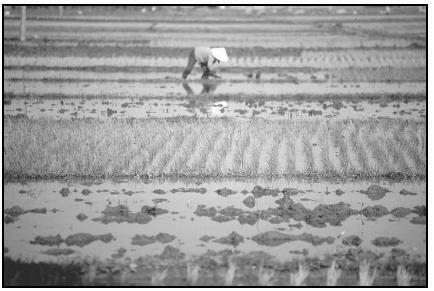 Planting and harvesting rice is labor intensive. Beat eggs, sugar, coconut milk, and vanilla until frothy. Pour into ramekins (small baking cups). Place in a steamer over boiling water. Cover and cook about 20 minutes or until set. Chill. Of the many influences that China has had on Vietnam, the most profound is probably the introduction of Buddhism. The widespread practice of Buddhism in Vietnam has led to the development of one of the world's most sophisticated style of vegetarian cooking ( an chay ), particularly in the coastal city of Hue, which is home to many Buddhists. On the first and middle days of each lunar month (the full moon and a sliver moon), many Vietnamese do not eat meat, seafood, chicken, or eggs. On these days, the street vendors have numerous vegetarian dishes available. Following is a recipe for a traditional Buddhist vegetarian dish. In a deep saucepan, bring coconut milk and pumpkin to a boil. Cook for about 10 minutes, until pumpkin is half done (still too firm to be easily pierced with a knife). Add the sweet potatoes and mushrooms.. Reduce heat and simmer until sweet potatoes are tender. Add thick coconut cream, peanuts, and zucchini. Bring to a boil again, then remove from heat. Season with salt and sugar. Serve garnished with fresh cilantro leaves. Tet Nguyen Dan (often referred to simply as Tet) is the Lunar New Year, perhaps the most important holiday of the year. The New Year does not fall on the same date every year, although it is always in January or February. The official holiday lasts three days, but it is often celebrated for a full seven days. In many ways, the Tet "holiday season" is not unlike the December "holiday season" in North America. Tet Nguyen Dan literally means "first morning of the first day of the new period." It is believed that the course of these few days determines the events of the coming year. People stop quarreling; children vow to behave; and families make special efforts to gather together. Prior to the celebration, homes are cleaned and painted and decorated with yellow hoa mai (peach blossoms. Many Tet traditions concern Tao Quan , the Spirit of the Hearth or the Kitchen God. It is believed that the Kitchen God leaves the household during Tet to report on the family to the Emperor of Jade. (Cleaning is avoided during Tet, so good luck will not be "swept away.") New clothes are purchased, and old debts are repaid. Many superstitions and traditions revolve around Tet, the Vietnamese Lunar New Year. One such belief is that when a watermelon is cut open, the redder the flesh, the more luck the family will have in the upcoming year. Families construct a Cay Neu (New Year's tree) from a bamboo pole stripped of its leaves except a few at the top and then decorated with red paper. (Red is believed to ward off evil.) The Cay Neu stands in front of their homes to protect them from evil spirits while Tao Quan is away. Families prepare and partake in feasts that include such rare treats as sup bao ngu (abalone soup) and canh vay ca (shark's fin soup). People carry gifts of food to family and friends. The following recipe for banana cake might be considered the Vietnamese equivalent of fruitcake. In a mixing bowl, sprinkle ½ cup of the sugar over the sliced bananas. Set aside. In a saucepan, cook ½ cup of the sugar in the coconut milk until dissolved; then stir in the vanilla. Soak the bread in this sweetened coconut milk. Grease a 12-square-inch nonstick baking pan and arrange ⅓ of the bananas on the bottom. Cover with half of the soaked bread, ⅓ more bananas, another layer of bread, and then finish with bananas. Drizzle the melted butter on top. Cover with foil and bake for one hour. Allow to stand for 12 hours before cutting. Vietnamese meals are rarely divided into separate courses. Rather, all the food is served at once and shared from common dishes set out on a low table. The family sits on mats on the floor, and each person has a rice bowl, chopsticks, and soup spoon. Family members use the narrow end of the chopsticks to bring food to the mouth and the wide end to serve from the common dishes. 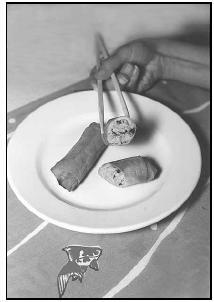 Certain foods, such as spring rolls, are picked up and eaten out of the hand. Most meals include soup, a stir-fry or other main dish, a light salad, and a variety of side dishes. Snacks are often purchased from street vendors. Popular handheld snacks include spring rolls or pork meatballs on a stick. These foods and pho (beef noodle soup) are the equivalent of fast food in Vietnamese cities. Also common between meals are sweet fruits and ice cream, introduced during the Vietnam War era (1960s and 1970s). Another "imported" snack food is a baguette with pâté, a holdover from the years when Vietnam was a colony of France. Tea ( che or tra ) is the most common beverage in Vietnam. It is common practice to prepare enough tea for the whole day first thing in the morning because traditional Vietnamese hospitality dictates that one must be able to serve tea immediately if unexpected visitors drop by. Tea is served before and after meals, but not during. Vietnamese prefer green (unfermented) tea, but the black tea more familiar to Westerners is available in cities. Although most Vietnamese prefer tea, coffee is grown in Vietnam and is readily available in cities. Served both hot and cold, caphe is a well-known Vietnamese beverage consisting of coffee with sweetened condensed milk (recipe follows). Fresh coconut milk is another popular drink that is widely available from street vendors, who simply cut the top off a young coconut and then serve it with a straw. A particularly refreshing beverage on a hot day is soda chanh (lemon soda). Pour 2 Tablespoons of condensed milk into the bottom of each of four clear glass coffee cups. Slowly fill each cup with the coffee, making sure not to disturb the layer of milk at the bottom. Serve immediately. Each person stirs his/her own milk into the coffee before drinking. For iced coffee, pour the condensed milk into the bottom of four tall glasses. Fill the glasses to overflowing with ice cubes, then slowly pour in the coffee. To make the simple syrup, combine 2 cups of sugar and 2 cups of water in a saucepan. Bring to a boil over medium heat, stirring occasionally until the sugar is dissolved. Continue cooking without stirring for about 5 minutes, until the mixture is clear and the consistency of light syrup. Either use immediately or pour into a clean, dry jar and refrigerate, covered tightly, until ready to use. Makes about 2½ cups. To make lemon soda: In a pitcher, combine 1 cup simple syrup and lemon juice. Stir to mix well. Fill six glasses with crushed ice; then pour ¼ cup of lemon syrup in each glass. Fill the rest of the way with sparkling water, stir, and serve immediately. In southern Vietnam, it is impolite for visitors to refuse a meal. If guests are not hungry, they may excuse themselves by explaining that they have eaten very recently, and then sit down with the hosts and keep them company during the meal. Polite guests will take a small amount so as not to insult their hosts. In northern Vietnam, the situation is reversed. Invitations to join someone for a meal should always be refused unless they have been repeated many times. This custom most likely stems from the fact that, historically, people in the north did not have enough food to feed an extra mouth. Even though invitations are extended out of courtesy, a guest is expected to refuse them. Vietnamese city dwellers frequently eat meals outside the home. For example, pho bo is available on almost every street corner in the morning, and there are spring rolls or pork meatball kabobs later in the day. The cost of meals outside the home can vary widely depending on the type of establishment in which they are purchased. A street vendor meal (the Vietnamese equivalent of "fast food") might cost US$1 to 2, whereas a meal in a sit-down restaurant ranges from US$4 to 8 per person. At the most exclusive restaurants, an elaborate meal could run as high as US$40 per person. A typical "lunchbox" type item in Vietnam would be spring rolls, which can be prepared in advance and wrapped in plastic wrap to be eaten out of hand later. In a small bowl, mix together soy sauce, garlic, and honey. Place the pork tenderloin in a foil-lined baking pan. Pour the soy sauce-garlic marinade over the meat and turn to coat. Roast about 35 minutes or until the pork is thoroughly cooked. Allow to cool; then slice into 1½-inch-long strips. Poach the shrimp in boiling water until pink; then peel, slice in half lengthwise, and devein. Set aside. Heat water in a saucepan to cook the rice vermicelli. Soften the vermicelli in hot water; then cook until just tender. Rinse under cold water and drain. Set aside. Separate the lettuce leaves; rinse, dry, and remove the tough center ribs. In a large bowl, toss together the pork, rice vermicelli, carrots, mint, and cilantro. Fill a roasting pan with hot water. Dip one rice paper wrapper into the hot water; then place it on a dishtowel. Arrange a lettuce leaf on the lower third of the wrapper; then spoon 2 Tablespoons of the pork filling onto the lettuce. Fold the bottom edge over the filling and tuck in the sides. Place 2 shrimp halves, cut side down, on top; then roll up into a tight cylinder. As the spring rolls are completed, place them on a serving platter and cover with a damp towel to keep them from drying out. These can be prepared ahead of time and wrapped in plastic wrap until ready to eat. Vietnam's population is growing rapidly, and the farmers must work hard to produce enough food. Vietnam produces about 25 million tons of rice per year, making it the world's third-largest exporter of this commodity (after Thailand and the United States). Agricultural products include rice, corn, potatoes, soybeans, coffee, tea, bananas, poultry, pork, fish, cashews, and sugarcane. Socio-economics determines how much protein is in the Vietnam diet. The poorest Vietnamese eat less beef, pork, fish, and poultry than do the upper classes. Consequently, iron-deficiency anemia and other dietary deficiencies are more common among the rural poor. City dwellers tend to fare better economically and are more likely to have access to refrigeration, safe drinking water, and sanitation. Ferro, Jennifer. Vietnamese Foods and Culture . Vero Beach, FL: Rourke Press, 1999. Halvorsen, Francine. Eating Around the World in Your Neighborhood . New York: John Wiley & Sons, 1998. Jeys, Kevin, Emily Kendrick, and Taran March, Eds. Vietnam, Cambodia and Laos Handbook . Chico, CA: Moon Publications, 1996. Robinson, Daniel. Vietnam, Laos & Cambodia: A Travel Survival Kit . Berkeley, CA: Lonely Planet Publications, 1991. Shalant, Phyllis. Look What We've Brought You from Vietnam: Crafts, Games, Recipes, Stories, and Other Cultural Activities from Vietnamese Americans . 2nd ed. New York: J. Messner, 1998. Tran, Diana My. The Vietnamese Cookbook . Sterling, VA: Capital Books, 2000. Trang, Corinne. Authentic Vietnamese Cooking: Food from a Family Table. New York: Simon & Schuster, 1999. Embassy of the Socialist Republic of Vietnam in the United States. [Online] Available http://www.vietnamembassy-usa.org/ (accessed July 17, 2000). Vietspace. [Online] Available http://kicon.com (accessed July 17, 2000). VNN Media. "Vietnam News Network." [Online] Available http://www.vnn-news.com/ (accessed July 17, 2000). Under the heading History and Food in the Vietnam Food article, you mentioned that "In the 1960s and 1970s (Vietnam War era), the U.S. military introduced ice cream to Vietnam..." This is not quite true. I grew up in Vietnam in the 40's and 50's and there was ice cream everywhere in the country at that time. A more correct statement would be "In the 1960s and 1970s (Vietnam War era), the U.S. military made ice cream more readily available in Vietnam..." or "In the 1960s and 1970s (Vietnam War era), the U.S. military introduced American-style ice cream to Vietnam..."
I believe this is an amazing site and there are very informative things on here, but I believe you need pictures of all the foods. So then when people view it they can have a visual idea of what Vietnamese people eat. I am Vietnamese myself &nd I even found this article REALLY informative. Of course I knew everything on here already but I didn't really know much about the Tet story. I'm only 14 &nd my parents have never told me a story like this &nd we haven't ever done this before either. So I find this really interesting &nd makes me wonder why we never follow the tradition? Okay well good job on the article! This is VERY informative but i think that some/most of it should be summed up!